Tales from the Past - Stories for the Future" came to life at a Grundtvig contact seminar in Udine, Northern Italy in October 2005. The partners, from Spain, Italy, Lithuania, Belgium, Germany and Wales UK met there and came up with the idea of improving the language skills of learners through the art of storytelling, with an emphasis also on promoting a greater cultural understanding of our own culture and heritage and those of our partner's countries. As we stated on our original application "the motivation for this project stems from a belief that in order to foster understanding and harmony between cultures it is necessary to know our own roots"
This has been achieved through the researching and telling of local stories which have been presented in a variety of ways ranging from traditional oral telling through to theatrical plays and films. 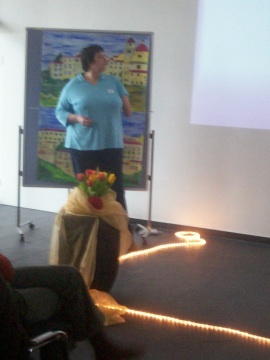 At each mobility we have arranged for relevant workshops to be held, such as vocal training and producing for radio; presentations of stories from all partners have been given; staff meetings have been conducted to monitor and evaluate practice and progress and to plan for the future; and a range of appropriate social events have been organised to enhance the cultural experience of the participants. These have included live performances and visits to places of cultural significance. Between each mobility work has progressed with the refinement of the individual stories and product production - we have all contributed to an audio CD and to a set of cards detailing the work of each partner that can be utilised by others. The individual projects are all hopefully intending to continue in some form - either through use of the methods initiated, by others within partner`s organisations, or through participants remaining working together because they are enjoying the learning.